Following on from part 1 & part 2, I am going to take a look at the next two sound effect collections from Rabbit Ears Audio. Metal Machines and Military Vehicles…. 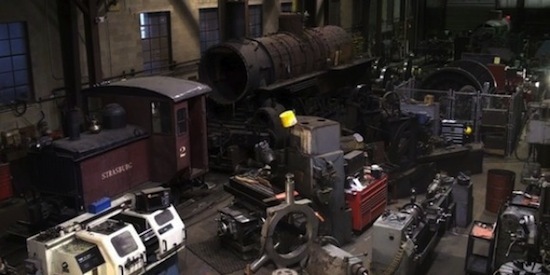 Machines that handle large lumps of metal are rapidly disappearing from everyday lives .But there are small bands of enthusiasts that need to keep them alive so that they can keep machines like steam engines alive too. Michael visited a workshop whose primary focus is repairing old steam locomotives and building replicas for use around the country. This library features 11 pre-1950s tools that will add texture to your mechanised needs. He hired a machinist to perform the mechanical masterpieces of the industrial age: Wheel Lathe, Metal Planer, McCabe Metal Flanger, Metal Shaper, Summit Engine Lathe, Summit Engine Rapid Traverse, Hendy Engine Lathe, Vertical Turret Lathe, Bridgeport Milling Machine, Large Air Needle Scaler, Small Air Needle Scaler. Do take time to visit the Metal Machines page on the Rabbit Ears Audio site. Michael has posted a video of a 1910 wheel lathe which is one of only two still in operation in the US. REA 004 METAL MACHINES PREVIEW by sepulchra. All the recordings have recorded very carefully with clean starts and the tails allowed to decay way into the very quiet background. Michael has been careful to provide a range of speeds as well as different points of view which again lend themselves to producing very convincing surround effects Although Michael’s favourite is the wheel lathe, for me the air release sounds from the McCabe Flanger are amazing and they will find so many uses way beyond the obvious. If you need the sound of a release of gas or steam under pressure then these will be great and unlike the sounds you get from a steam engine say, these release sounds are absolutely clean. Another gem for me is the start up sounds from the electric motors that drive most of the machines in the collection, more manna from heaven for all you sound designers. Check out the Large Needle Scaler the sounds that come from that as a punch rattles the metal are amazing. Finally the sound that caught me was the stalling sounds Michael has captured from Summit Engine Lathe. I would have loved to hear some of these machines under load, the scraping and graunching sounds would have been amazing. Rabbit Ears Audio are offering the Metal Machines in both 96K and 192K sample rate formats, you choose. Hi-Res Price - $70 - for a single user license. If you are a multi-user site then contact Michael and he will provide you an invidual quote. Price - $50 for a single user license. If you are a multi-user site then contact Michael and he will provide you an invidual quote. M5A1 Stuart Tank: In service WWII and Korean War. Engine: 2x Cadillac Flathead V8. M41A2 Walker Bulldog Tank: In service 1951-1970s. Engine: Continental AOS-895-3. M106A1 Mortar Carrier: In service 1960s-1980s. Engine: 212 hp Diesel. M4A2E8 Sherman Tank: In service 1942–1955. Engine Diesel GM 6046 (2×6-71 inline). 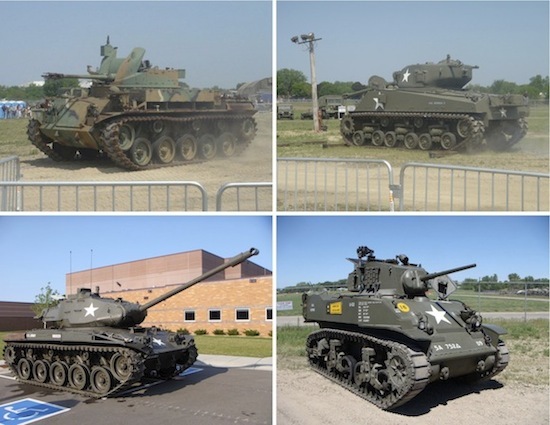 M42A1 Duster Tank: In service 1953-1963. Engine: 6-cylinder air cooled gasoline. M75 Armored Personnel Carrier: In service Korean War. Engine: 6-cylinder AO-895-2. Michael has sent me the the Stuart Tank to review as an example of one of the vehicles in this library. The first thing to note is that there are two audio folders, one for the exterior recordings and the other for all the on board sounds. Michael and Rob have been meticulous in their recording and cataloguing of this collection. They have captured the full range of different speeds and styles of ‘pass bys’ as well as takes of manoeuvres, most quite rightly recorded on earth, or as they call it ‘dirt’. However they have also included a couple of pass by tracks recorded with the tank passing on the pavement for those ‘parade’ applications. Moving on board, each recording has been captured from 7 different perspectives so you can choose your point of view and again enables you to build up complex surround sound effects, you get all the bouncing, rattling and shaking as they travel, great! This has been so well thought through and executed that you will be able to use these recording for a wide range of ‘machines’. You can buy each vehicle on its own or buy the complete collection at a discounted price. M5A1 STEWART - $95 - for a single user license. M60A3 COMBAT TANK $95 - for a single user license. M41A2 WALKER BULLDOG $95 - for a single user license. M106A1 MORTAR CARRIER $95 - for a single user license. M4A2E8 SHERMAN $95 - for a single user license. M42A1 DUSTER $75 - for a single user license. MILITARY VEHICLES COMPLETE COLLECTION $499 - for a single user license. If you are a multi-user site then contact Michael and he will provide you an invidual quote.